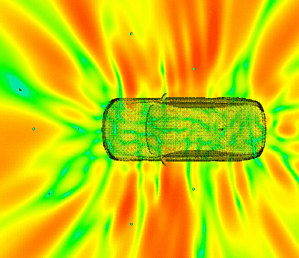 The acoustic design gains in importance during the development of vehicles. Besides the interior noise behavior also the exterior noise behavior is of high interest. In order to assess the exterior noise behavior at idle speed of a vehicle, up to now laborious test stand measurements on prototypes are required. The sound pressure is measured and recorded with several microphones at well-defined positions in the exterior space of the vehicle. 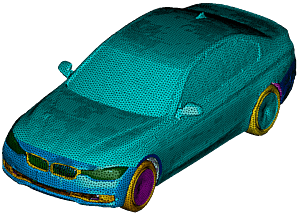 As a pilot project it should be demonstrated that the exterior noise behavior can be predicted by simulation as far as the relevant noise sources are known with sufficient accuracy. The classical boundary element method (BEA) was chosen for this project. This method consumes comparably much memory and simulation time. However, it provides reliable results. Other methods like the fast multipole method (FMM) were also examined, but had to be rejected because of large deviations especially at the thin-walled structures around the engine compartment. The top figure shows the applied BEA mesh. The element size is suitable for the frequency range up to 2 [kHz]. As examples, the mid figure shows the sound pressure distribution on the outer surfaces of the vehicle at 165 [Hz] and at 840 [Hz]. Two different cutting planes through the vehicle were chosen for viewing these results. At 840 [Hz] the sound pressure distribution in the engine compartment and in the cardan tunnel appear to be rather complex. The lower figure shows the sound pressure distribution in the vehicle’s exterior space at 840 [Hz] within the horizontal plane of the measuring microphones above the vehicle. The shadowing of the vehicle can be clearly seen. 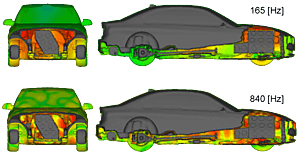 In summary, it was proven that with this method the exterior noise behavior of a vehicle can already be assessed before any prototype exists.